2 Neil Taylor 8:38	 M Budweiser Sweat bands slowed him down. 3 Adam Palmer 8:40	 M Labatt Blue Has a man-crush on Gregory. 4 Ben Jurkovic 10:16	 M Molson Canadian Wanted to carry a dumbell during the race, but wasn't allowed. 5 Jim Richards 10:39	 M Lakeport Honey Says his sleeveless shirt made him feel fast. 6 Jason St-Denis 10:48	 M Kokanee Will never disrespect the Beer Mile again. 7 John M Campbell 12:09	 M 51 Molson Canadian Still has never had to run a penalty lap. 8 Ron Lariviere 13:22	 M Steam Whistle Was very emotional when he heard of his son's fine showing. 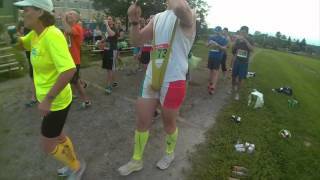 9 Paul Mitchell 20:10	 M Molson Canadian Said his excuse was that he's a grandfather...and that he was running with the chicks. 10 Janice Morton 26:12	 F Budweiser Has never, ever expressed a single drop of sweat in her life, except during this event. 11 Lorraine Gavloski 27:17	 F Lakeport Honey Lager Is building a Beer Mile Track in her backyard now she's so addicted. 12 Kendra McKinnon 34:44	 F Molson Canadian Still thinks she isn't a 'Woo-Hoo Girl'. 13 Liz Dowling 35:10	 F Lakeport Honey Lager Keeps showing up at the track to see if any more Beer Miles break out. 14 Grace Panoff DNF	 F She's a hundred miler and above this lot. 14 brave and hearty souls (8 males, 5 females, and 1 SOB) joined us for the running of the first annual, DUNDAS ONTARIO Beer Mile!